Have you wondered what God is doing in your difficult circumstances? Why God allows suffering into our lives? It’s natural to ask why and to want to see some benefit from our suffering, because it makes us feel better if we can see good coming out of the difficult situations in our lives. It makes it seem more “worth it” when we can see a purpose for it all. If you’ve ever wondered what God is up to, then I have good news for you. God IS doing something. He is doing something very good, indeed. God’s Word promises us that the trials in our lives are producing in us a character that is mature or complete. God is using the difficult situations in our lives to build in us qualities like patience, empathy for others, kindness, and a strong faith in Him.Our trials are giving us the gift of being able to see beyond the shallow things in life and find true meaning and value in those things that are really important. This produces in us wisdom and spiritual depth that only comes from enduring the really hard stuff of life. God is creating something beautiful in us through it all. When you live with chronic illness, there is a tendency to think of yourself as “broken.” In the midst of that broken feeling, let it bring you real joy to know that God is making you beautiful through the brokenness in your life. Be encouraged that you are becoming more and more like your Savior, who learned obedience and humility in His suffering (see Philippians 2:5-11 & Hebrews 5:8). It is a beautiful thing to become like our Savior, and it is in becoming like Him that others are drawn to Him through us. They see something different in us–real joy, real hope, real peace. When that happens, be courageous and tell them where your joy, hope, and peace come from. Tell others what anchors your soul in the storms of life. Let your light shine like a lighthouse shines in the darkness, and share that light with others who are living in darkness. That is the reason God leaves us here on earth in the midst of our pain. I truly believe that it makes God sad to see us suffer (see Lamentations 3:33). If making us happy were the only goal, God would bring us to heaven to be with Him. But it’s not. There are people that still need Him, and we are the ones God wants to use to draw more people into relationship with Himself. Think about it. Why else would God leave us here in difficult circumstances? It can only be that He wants to take as many of us to heaven as possible. If we don’t tell others about real hope, who will? Who do you know that needs real hope? Dear God, give us courage to hold out the hope that we possess. Help us to let your light shine through us so that others can see You. Thank you for making us beautiful and using us in your perfect plan to help others come to You. 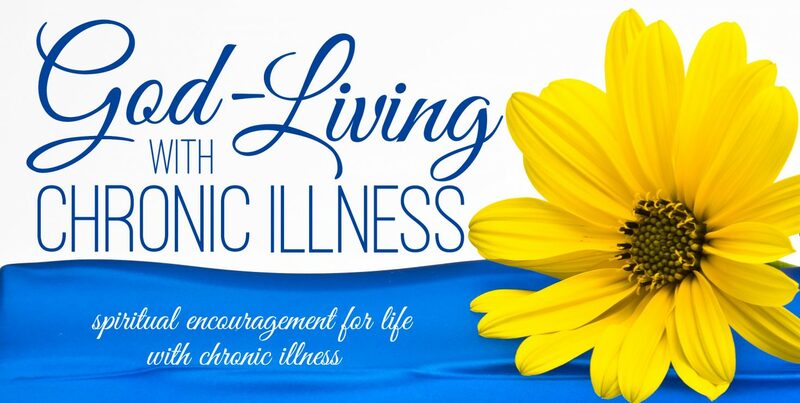 You saw this post first on God-Living with Chronic Illness, a website dedicated to providing spiritual encouragement and resources for those living with chronic pain or illness. You are welcome to pass this post forward to those you know that may benefit from this information, but please respect the copyright privileges of the author. Disclaimer: The author and God-Living with Chronic Illness do not receive any compensation for references to specific products, ideas, people, or websites. The ideas posted are not intended as medical advice and should not be taken as such in place of your physician’s recommendations. Hi! My Name is Laurie, and I am a wife, mom, nurse, and patient living with fibromyalgia. I understand first-hand what life is like with chronic pain and illness. My passion is to help provide others with the spiritual encouragement and resources that I so desperately needed when I was first diagnosed. Please join us on the blog (god-livingwithchronicillness.com) and Facebook page (www.facebook.com/godlivingwithchronicillness) for regular encouragement and hope. Welcome! This entry was posted in Faith, Finding Real Hope, Life with Chronic Illness and tagged Chronic illness, Faith, pain, suffering, why?. Bookmark the permalink. Welcome to God-Living with Chronic Illness! You are not here by accident, dear friend. God loves you and wants to help you find peace and joy even in this difficult season of life. Here you will find resources and encouragement for life with chronic illness and pain. Look around, search by topic for specific issues, and don’t forget to sign up for encouragement directly to your inbox. Together we will let God light our way through the darkness of chronic illness! Looking for a particular topic? Search here. Cibeara's Hope provides help to families in crisis due to chronic illness. Click on the image above for more information and to learn how you can help provide hope to others with chronic illness. Warm up your heart and body with a God-Living Girls mug!